17" tall, The Old Soldier wears a double breasted khaki greatcoat and cap. 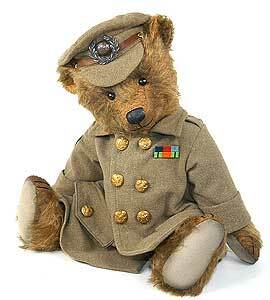 Each bear is an individual and the mohair will vary as will the vintage khaki material and military insignia. Hand made by award winning UK bear artist Jennie Sharman-Cox. THIS IS A SPECIAL ORDER ITEM! PLEASE ALLOW UP TO 12 WEEKS DELIVERY!